Košice may seem like a small, unassuming city—but believe it or not, it was one of Europe’s Capital’s of Culture recently and really packs a punch! It combines everything I love about Eastern Europe with everything I love about an authentic European experience: small cities, local shops, and tons of fascinating history and culture to explore. And in fact, for all that it feels like the kind of place where everyone knows everyone and everything is in walking distance—it’s the second-largest city in Slovakia! Don’t believe me? Check out this list of not-to-be-missed places and start planning your trip today! This 14th-century cathedral is at the heart of Košice’s medieval center, and it’s well worth a visit during your time there. It’s Gothic-style—a rarity in Eastern Europe—and is also the largest place of worship in Slovakia. But even if you’re not religious or interested in the architecture, this cathedral is worth a visit: you’ll get incredible views over the city and the surrounding landscapes from the top of the cathedral’s northern tower! St. Elisabeth’s Cathedral. © TTstudio / Shutterstock inc.
St. Elisabeth Cathedral at night. © Olena Z / Shutterstock, Inc.
View from St. Elisabeth cathedral © In Green / Shutterstock, Inc. When to Go: The cathedral is typically open from 10am to 5pm. If you’re planning on heading up the northern tower, I recommend you go a little before sunset! Košice’s quaint main street is one of those typical European streets—something out of a postcard! It’s totally pedestrianized, and you’ll find that a lot of the city’s sights are located along the street. So have a little stroll, do some people-watching, visit one of the cafés, and enjoy the European lifestyle! Main street of Kosice, Slovakia. © Tatyana Vyc / Shutterstock, Inc.
Main street of Kosice, Slovakia. © Olena Z / Shutterstock, Inc. When to Go: This street is bustling at any time of the day! During the afternoon, you’ll likely find a plethora of musicians and other buskers out there—but my favorite time to visit is in the evening, so I can sit at a café like Fontána and people-watch to my heart’s content. Also located in the older part of Košice and right near St. Elisabeth’s Cathedral, you’ll find St. Urban’s Tower. The structure itself originally also dates to the 14th-century, but inside of it today, you’ll find a small museum (including wax figures) dedicated to the city’s long history. If you don’t know much about Košice and the surrounding area, I definitely recommend you check it out! St. Urbans Tower in Kosice, Slovakia © TTstudio / Shutterstock inc. When to Go: The tower typically only receives visitors on Sundays, Mondays, and Thursdays—so plan your visit accordingly! Believe it or not, many of Košice’s historical buildings were once palaces. Of these are the Old Town Hall, Andrassy Palace, Bishop’s Palace, Jakabov Palace and a few others. They offer a great glimpse into Baroque, Hungarian, and Slovakian architecture in the region. Although you can’t go inside many of these buildings, it’s definitely interesting to wander around and glimpse them from the outside. Andrassy Palace. © In Green / Shutterstock, Inc.
Jakabov Palace. © TTstudio / Shutterstock inc. When to Go: Again, you can’t go inside many of these—so you can visit them day or night to view their incredible architecture! This Baroque building was constructed in the late 19th-century and is another fascinating example of architecture in the city. You’ll especially want to see the richly-painted ceiling of the theatre—see if you can identify the scenes from Shakespeare’s tragedies! Or catch a live performance here—the ballet shows are especially impressive. The State Theatre. © Mariia Golovianko / Shutterstock, Inc. The State Theatre. © BestPhotoStudio / Shutterstock, Inc. When to Go: Whenever there’s a show on! Check their website for listings. If you’re interested in outdoor activities, Slovakia can’t be beat. Head to the Tatra mountains for skiing, biking, hiking, and more. These mountains are an easy drive from Košice—or there’s even more hiking in closer to town; just ask for recommendations at your hotel based on the time of year that you’re there. Of course, these aren’t the Alps—but believe it or not, they rival the Rocky Mountains in the United States in terms of height! High Tatras, Slovakia © Kovop58 / Shutterstock, Inc.
Lake Ruzin in Slovakia countryside near Kosice. © TTstudio / Shutterstock, Inc.
Strbske pleso lake, Slovakia © Kovop58 / Shutterstock, Inc. When to Go: Make sure you check in with local guides regarding the weather conditions prior to any sort of trip—things can change frequently, and even if it’s comfortable weather in Košice, conditions could be a bit gnarly once you get into the mountains! Košice wouldn’t be keeping up with its Eastern European heritage if it didn’t have a few great watering holes spread around the city. A walk down main street will show you plenty of places. But a good rule of thumb: the further you get away from the main drag, the more likely you are to find yourself in the company of real Slovakian locals—and the less you’re likely to spend per drink! Golem Pivovar (biergarten) is a personal favorite of mine, both because sitting outside on a warm summer’s evening is the perfect time to have a beer and because the microbrewery offers some really tasty beers! When to Go: There’s no “wrong time” to head out drinking in Slovakia—you’ll find that locals will hit the bars in during lunchtime, after work, or later in the evenings, depending on what kind of day they’re having. So whenever you’re ready to go, you’re sure to find some company! Košice is a pretty enough city in itself, but it has nothing on nearby Levoča. This old, medieval town hasn’t changed much over the years—and in fact, today it’s home to the world’s largest wooden altar, established in the 14th century, as well as a Renaissance tower and other important historical bits. It’s an easy bus ride over from Košice, and I highly recommend visiting if you have an extra day to spend. Famous Town of Levoca, Slovakia © Filip Fuxa / Shutterstock, Inc. Famous Town of Levoca, Slovakia © A. Aleksandravicius / Shutterstock, Inc. When to Go: It can take an hour or two to get over to Levoča, so make sure you’re leaving yourself ample time! Plus, you’ll be driving through beautiful countryside along the way, so if you’re the type to stop and take photos (or your wife is), make sure you leave time for that as well. Obviously this is a seasonal thing, but if you get the chance, visit Košice around Christmastime. The city’s Christmas market is a bit smaller than you’ll find in other European cities, but what it lacks in size, it more than makes up for in quaint charm, with stalls of piping hot food (make sure to try the langós, a fried bread treat that can be either savory or sweet! ), mead, and handicrafts. It’s all set along the beautiful architecture of main street, and there’s really nothing quite so lovely. Jakab`s palace and Lovers` Bridge in winter © Mariia Golovianko / Shutterstock, Inc.
View of Saint Elizabeth Cathedral © Mariia Golovianko / Shutterstock, Inc. When to Go: Košice’s Christmas celebration usually runs from the first weekend in December up until Christmas Eve—make sure you check the dates online before scheduling your trip! # 10. Plan Your Visit to the Next Eastern European City! One of the great things about Košice is that it’s centrally located in Eastern Europe—meaning that it’s easy for you to head to the next stop on your itinerary, whether by car, train, or bus! Within easy distance are Bratislava, Budapest, Vienna, Krakow, and plenty more—so get traveling! 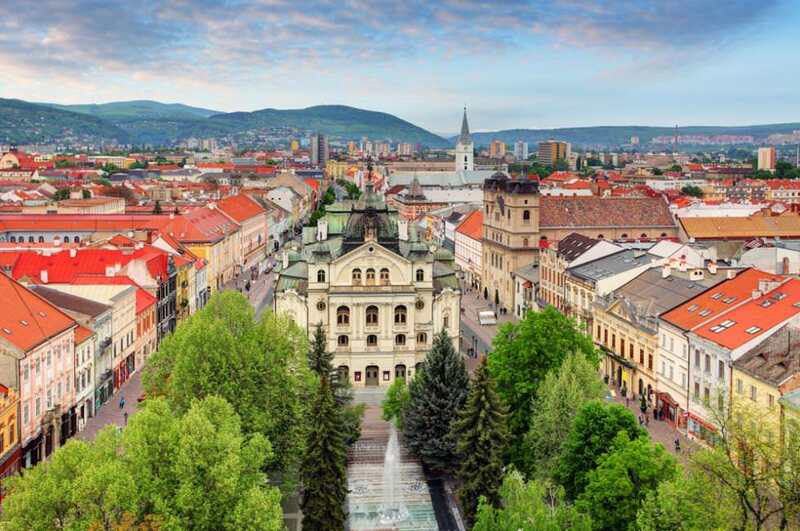 Bratislava © TTstudio / Shutterstock, Inc.
Have you visited Košice? Share your stories below!